Here we have the long awaited 70s horror film Nothing But the Night, finally available on DVD courtesy of Scorpion Releasing's Katarina's Nightmare Theater. 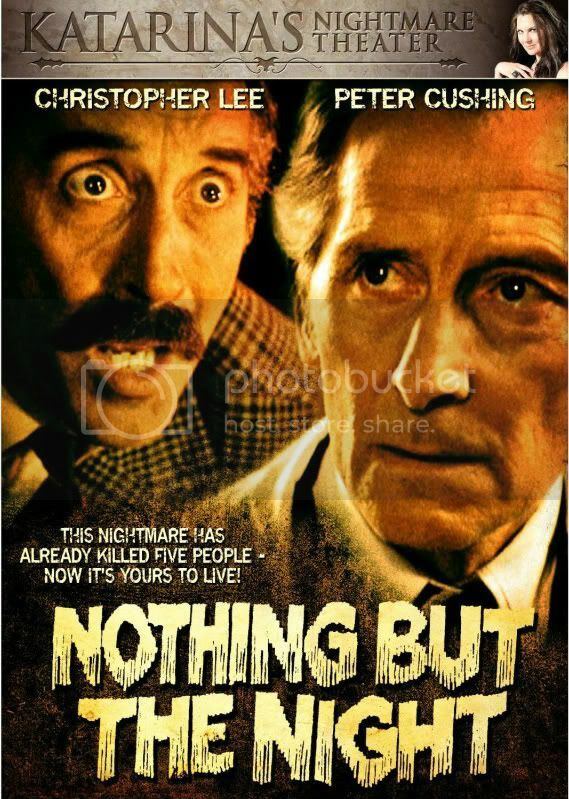 One of the many films pairing Peter Cushing and Christopher Lee, it's great to be able to see this officially released. This was the first (and only) film released under Christopher Lee's production company, Charlemagne Productions. Christopher Lee stars as police Colonel Bingham who is investigating a series of seemingly connected murders. The victims were all trustees of the wealthy Van Traylen fund, which owns an orphanage. Bingham is brought in, along with Sir Mark Ashley, the head pathologist at a hospital where one of the orphans is currently admitted after a bus crash killed some of the children. They are hoping that the child who survived can help them piece together what caused the bus crash and perhaps shed some light on the murders. The girl's real mother has come for her though and wants to kidnap her. Nothing But the Night is a very well done horror mystery which deals with occult and supernatural themes as well. The tone reminded me very much of The Wicker Man and it was nice to see Lee and Cushing together again, as two of the good guys no less. The story has a lot of twists and turns and the climax is exciting and very unexpected. The acting is all very professional and the film moves along at a brisk pace. There are a couple nice gory bits and some eerie supernatural scenes too. The DVD includes an intro with horror host Katarina Leigh Waters and trailers for other films in the Katarina's Nightmare Theater collection.